This morning I woke up with a bit of an itch on my torso, right by the lowest rib. I scratched, it felt funny; I scratched under my shirt and felt a little lump that I hadn't felt before. 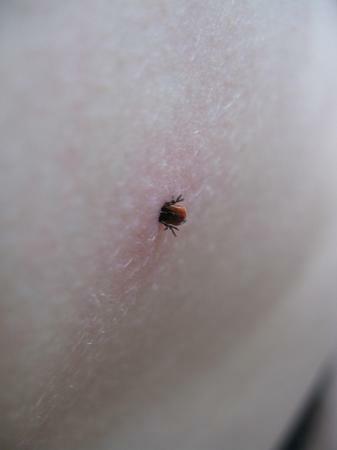 Immediately, I checked it out and noticed this little tick, moving legs and all, stuck in me. The idea of this creature having dug its head into my skin freaked me out a little. Last Tuesday, however, I found the tick-remover I wanted for a while and purchased that. After a minute of slightly freaked out searching for it I found the set, and tried out the small one. It wouldn't fit, so I used the bigger one. It worked as expected and much easier than the other tick-removers I have. It did hurt when I twisted the little bugger out (a bit of a burning sensation) and he insisted on trying to keep digging back in, but I won and flushed him down the toilet. I suspect it hitched a ride on Nano and then landed on the sofa where it secretly attacked me. I'll have a blood-test to check for Lyme's disease in a month or two, as it doesn't always give that specific rash (should I get a rash or any other weird complaints, I'll go to my GP immediately of course). The spot feels a bit sore, like a bruise, which I hope goes away soon. Now, if only I could shake that itchy feeling I've had all day. Brr.